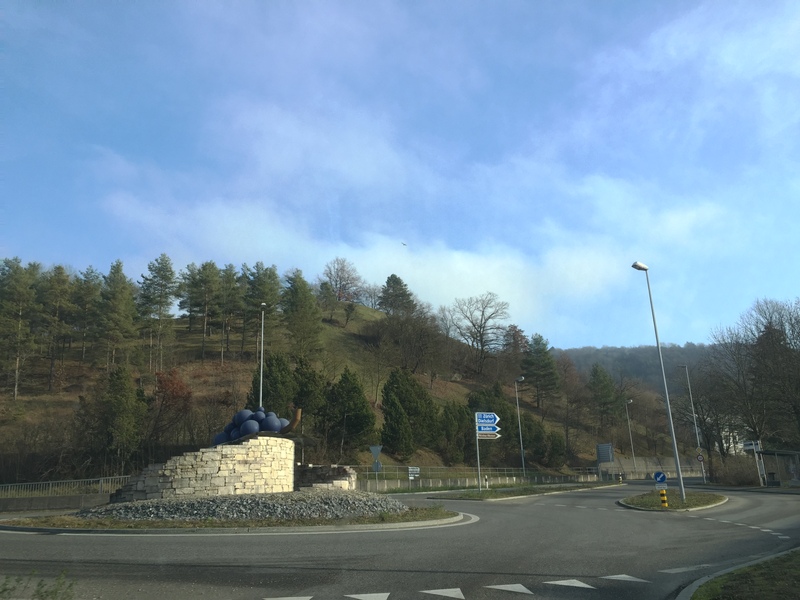 Wettingen is proudly the biggest “village” (as opposite to city or town) of Switzerland! Basically a big village near the city of Baden, historical home of the multinationals ABB and General Electric (former Alstom). 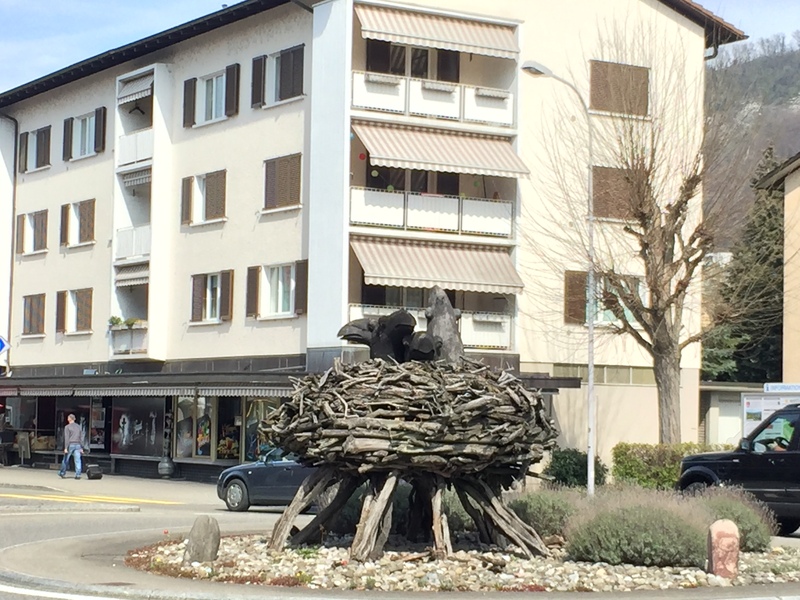 Even if Wettingen is not a city, on its streets you can find something unique! 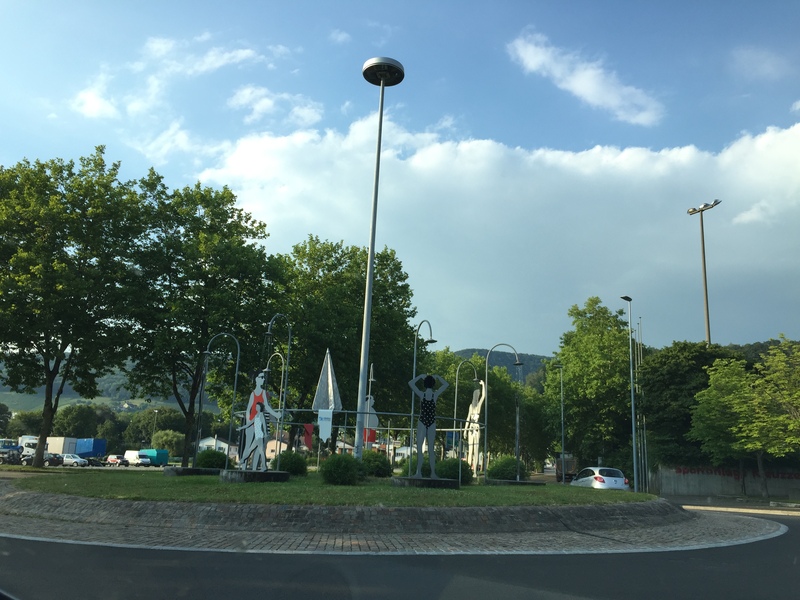 A roundabout with some figures wearing swimsuits and taking… shower! And the showers are real, they have real water! Of course the showers are working only in summer! We are in Switzerland, everything is planned! 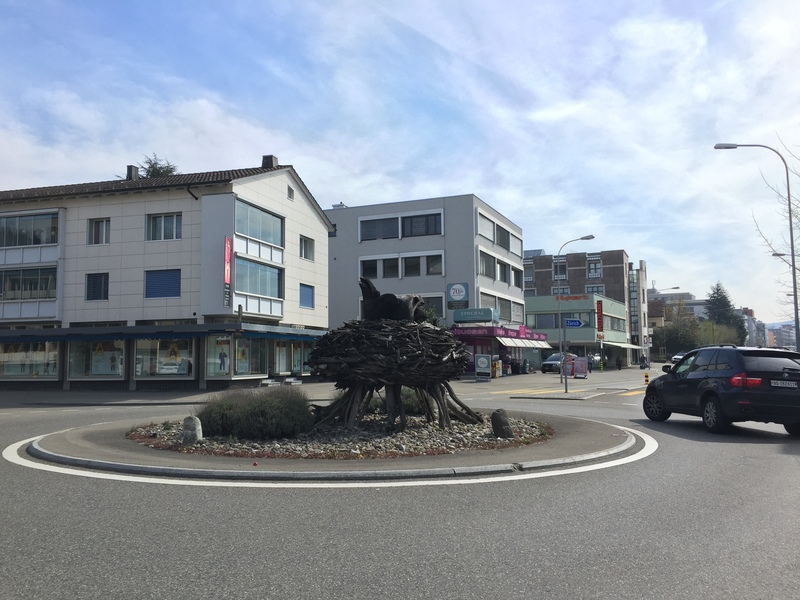 Yesterday I was driving through Nussbaumen (Gemeinde – community of – Obersiggenthal) and I noticed again its main roundabout. 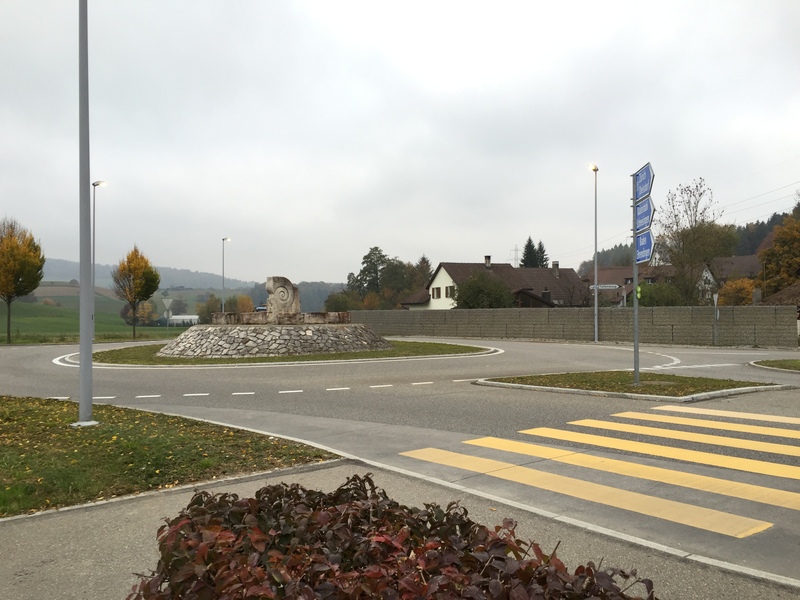 We can define it as a “seasonal” or “multi-purpose” roundabout. 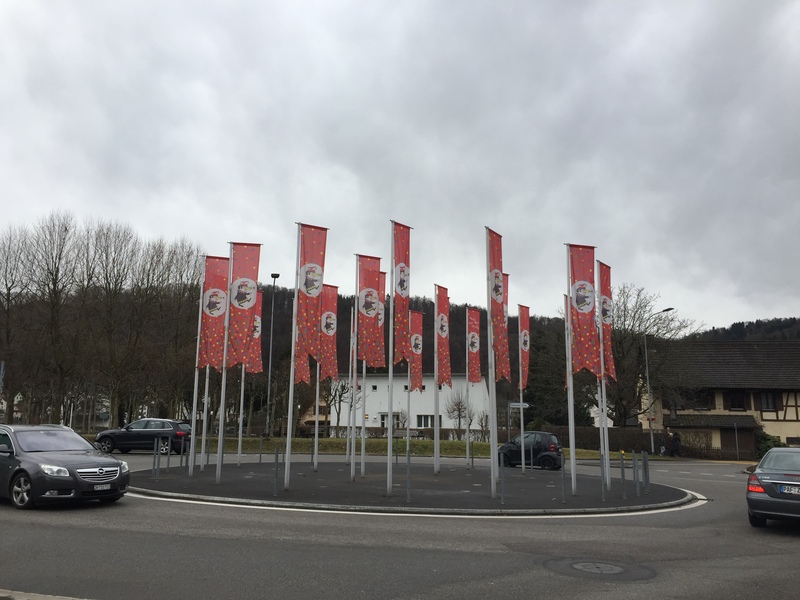 Thanks to the various poles, depending on the season or on some particular event, the roundabout can be “made up” with suitable flags or decoration. Now we are approaching the Carnival time… or, as they say here, “Fasnacht”. And that’s why the area is now full of flags showing a funny character with fake nose, laughable hat and pretending to dance. Welcome in Nussbaumen, a town with more than 30% foreigners, where you immediately see when it’s Carnival time! 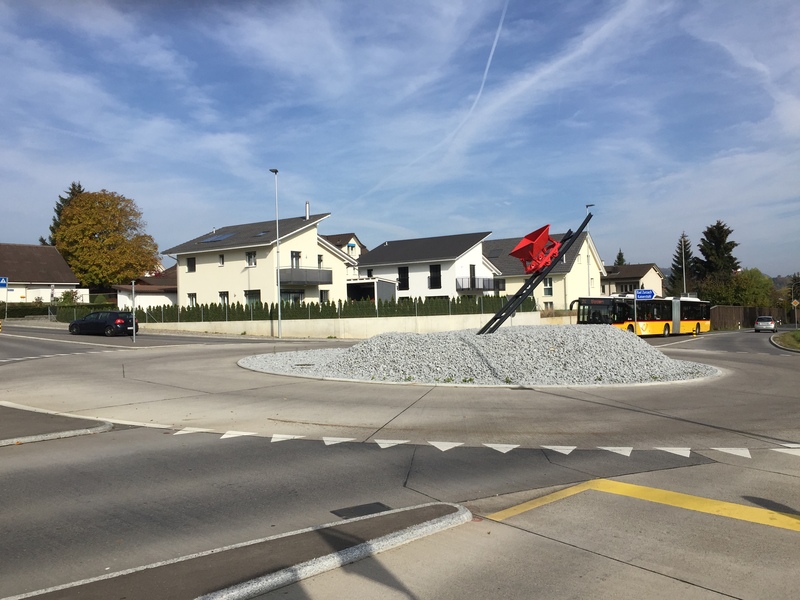 The newly redesigned roundabout in Schneisingen is modelled on the main big Company located in this area (actually in the neighbouring community of Niederweningen)… just next to this roundabout. – Bucher Landtechnik: Company selling tractors of leading brands in Switzerland. This is the first (!) 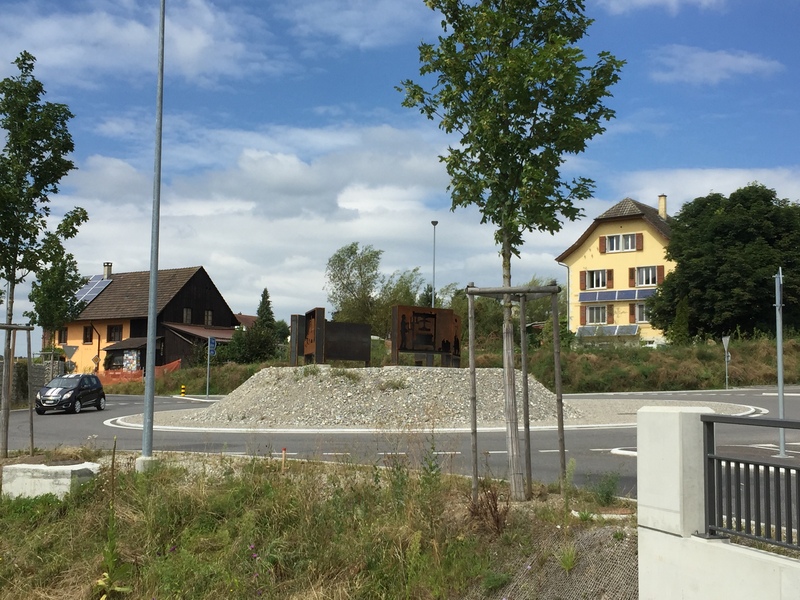 double roundabout (two roundabouts one after the other) of Canton Argovia in Switzerland, inaugurated in 2008. The artistic decorations were done by two local artists, who were given the task to create shapes representing the village of Ehrendingen (Tiefenwaag quarter). 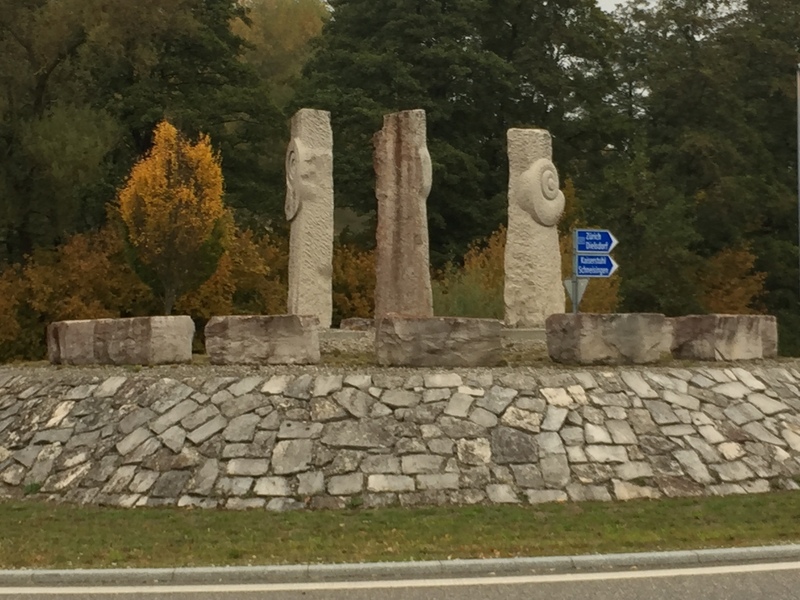 The sculptors referred to the special geology of this area. 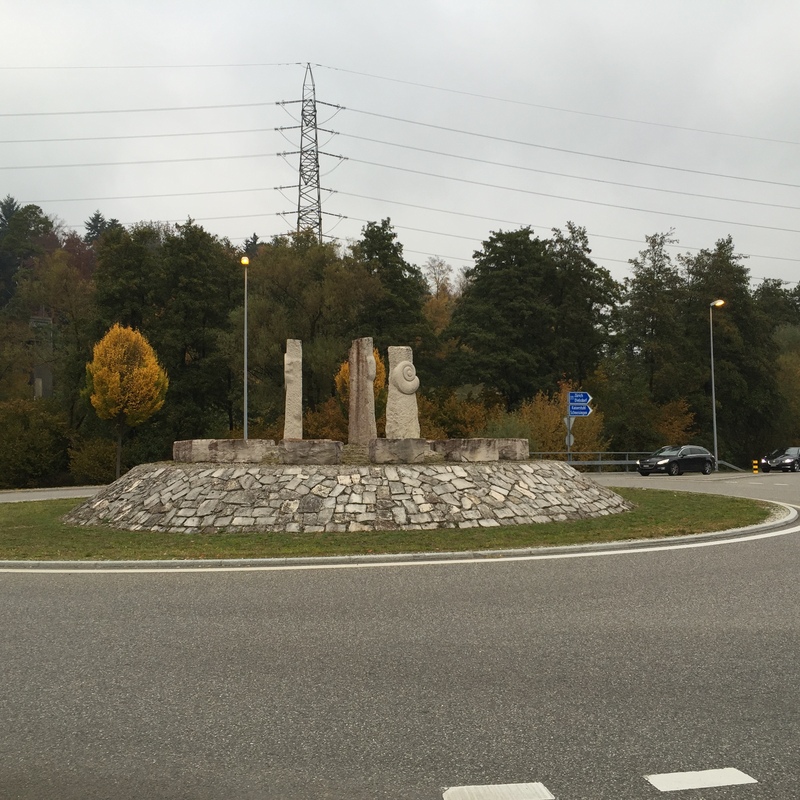 At the south-east border of the former cement quarry the formation of dogger stones was observed. In the sandy limestone and marl of the young dogger stones the following fossils could be found: mussels, brachiopods and even ammonites! (Many thanks for the information to the “Ehrendinger Runde, Kreisel Tiefenwaag”). Why the cable car wagon? 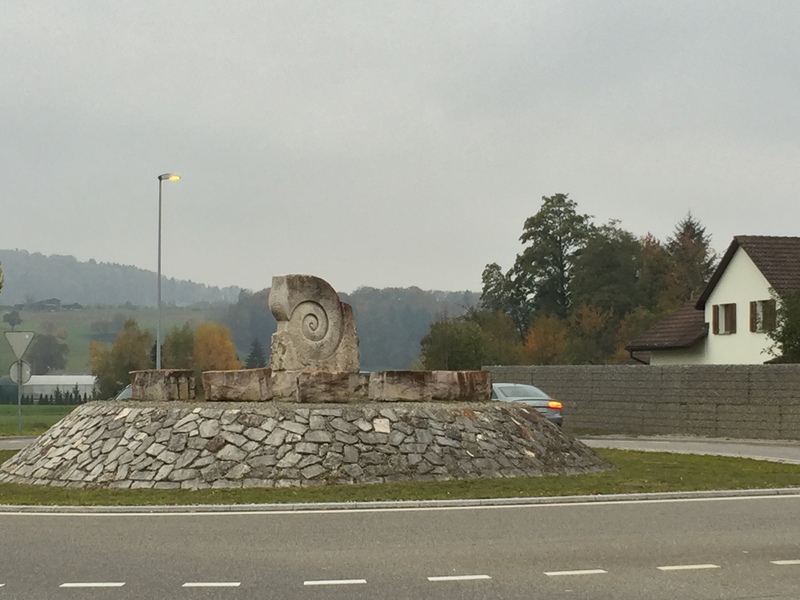 Already in the Middle Ages a gypsum mine was existing in Ehrendingen: gypsum was produced and milled in the village. At the end of the 19th century, the demand for construction material increased. And due to the fact that in this area also limestone and clay were naturally available, in 1892-1893 a cement factory was established. Around 400 people were working in this factory. 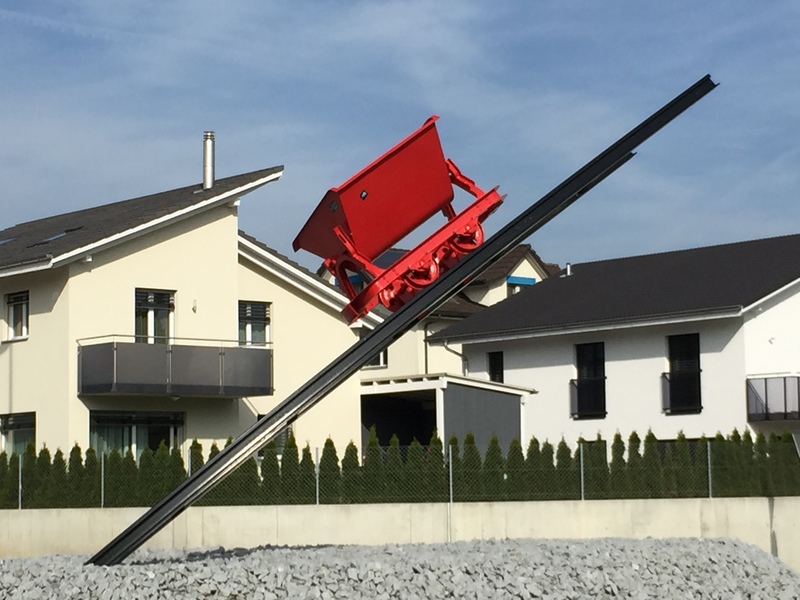 A rail cable car was transporting the material from the quarry to the factory. Another cable car connected the factory with the railway station of the neighbouring village of Niederweningen. Unfortunately, due to the relentless competition in the cement business and the crisis in the building industry, the cement factory dramatically bankrupted in 1902. Today only one building wing is remaining, the one where the offices were located.